I was walking through a grocery store recently when I stopped to look at the “breakfast” section. 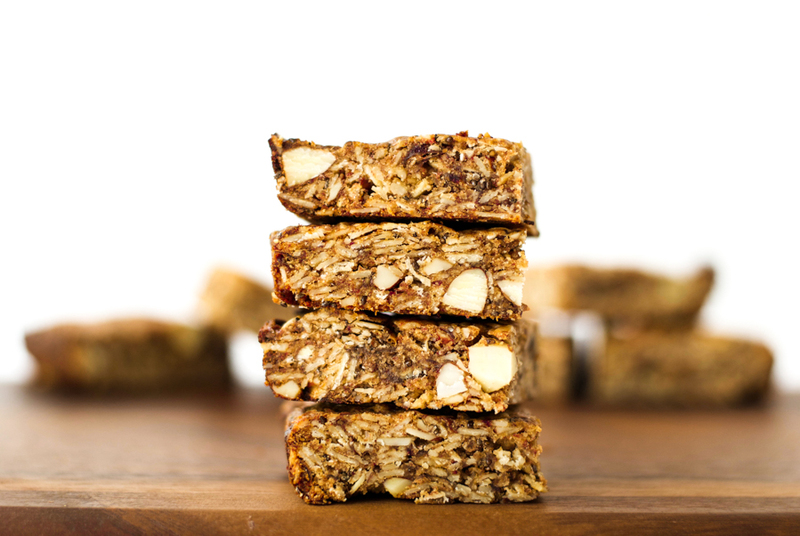 There were rows upon rows of breakfast bars, cereal bars, protein bars, granola bars, and many other so called ‘breakfast foods’. I took a few minutes to look at the ingredient lists of these products marketed as healthy breakfast options, and I was seriously perturbed. Most of them contained multiple types of sugar, sometimes up to seven different types. Many of them were made with refined grains instead of whole, depriving consumers of healthy fiber, vitamins, and minerals. Some even contained artificial colors. I was troubled by these products because they are marketed as healthy breakfast foods, when they are closer to being candy than a nutritious breakfast. It was with this in mind that I came up with these vegan, gluten free almond date granola bars. Now don’t get me wrong, I completely understand being in a time crunch and needing a fast breakfast option. But it really is crucial that we prioritize healthy food. Food has the power to prevent or create chronic disease. It has the power to contribute to or alleviate mental illness. The foods we choose to eat can have a profound effect on our physical and mental health. Every cell in the human body is created and energized by the nutrients we put in. That is why it is so important to put healthy food at the top of our list of priorities. One way to do that is to prepare healthy foods in advance for those times when time is tight. 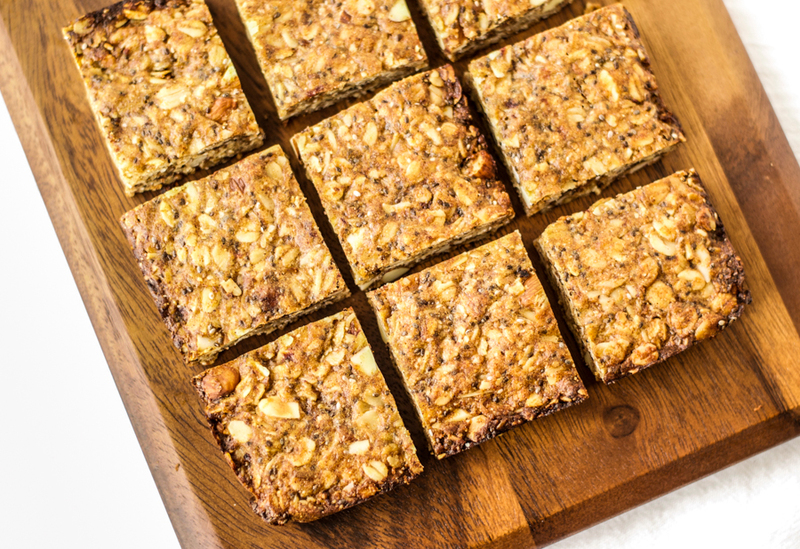 These vegan almond date granola bars are an excellent example of just that. 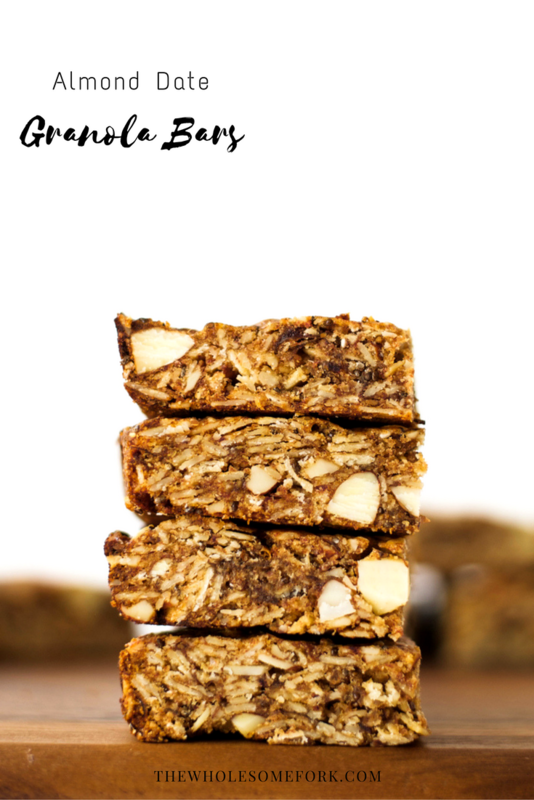 They make a wonderful snack or a great breakfast for busy mornings. 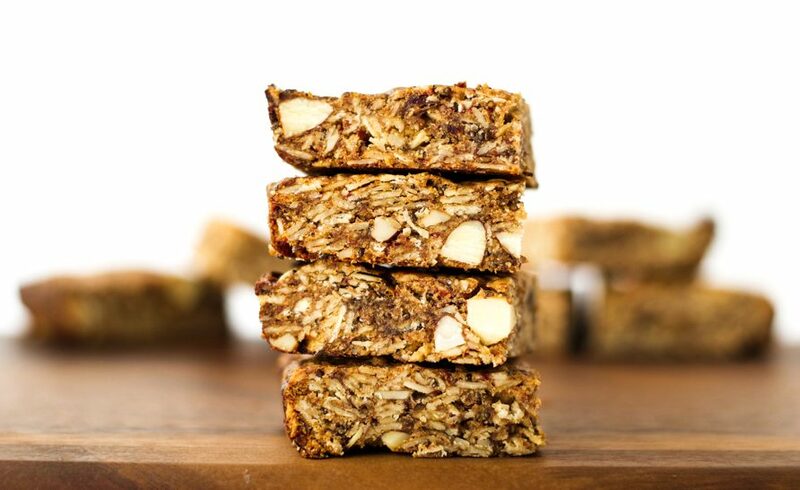 These vegan, gluten free almond date granola bars are made with oats, garbanzo bean flour, and almond butter for a protein and fiber-filled snack. Preheat the oven to 350F and line a square baking pan (8" x 8") with parchment paper. In a large bowl, combine the oats, garbanzo bean flour, flax seed, chia seeds, cinnamon, salt, almonds, and dates. In a small saucepan, gently warm the almond butter and honey (or maple syrup). Add the almond butter and honey, olive oil, and almond extract to the dry ingredients, and stir well to combine. Pour the mixture into the prepared baking pan, cover with a sheet of parchment paper, and press the mixture down well with your hands or a flat object (like a book). Remove the top piece of parchment paper and place in the oven for 25-30 minutes, until golden brown. Leave to cool completely before removing from the pan and cutting into squares. Store in an airtight container in the fridge for up to one week, or in the freezer for up to 3 months. Love the idea of using dates and honey to sweeten these! 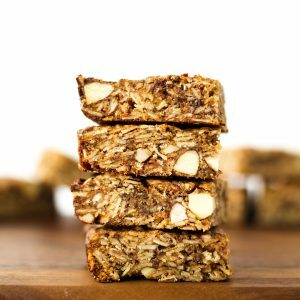 I’ve always had the same gripe about commercial granola bars! Yum, I want to try these soon! Good use for dates. Do you think the chickpea flour be substituted with something like almond flour?